Preheat a fan forced oven to 180°C. Place McCain Baby Carrots, oil, cumin, sumac and sugar into a baking dish and toss to coat. Roast for 20 minutes or until carrots are golden. Combine the coconut cream and lime zest in a small mixing bowl. Taste and season with salt and pepper. Place baby spinach on a serving platter, top with Spanish onion, arrange roast McCain Baby Carrots on top, sprinkle with Bombay mix and top with pomegranate seeds. Drizzle dressing over the top of the salad and serve immediately. Combine all ingredients in a large mixing bowl. Shape mixture into small football shaped sausages – you should get about 15-20 per 500g of mince. BBQ, grill or pan fry until cooked. 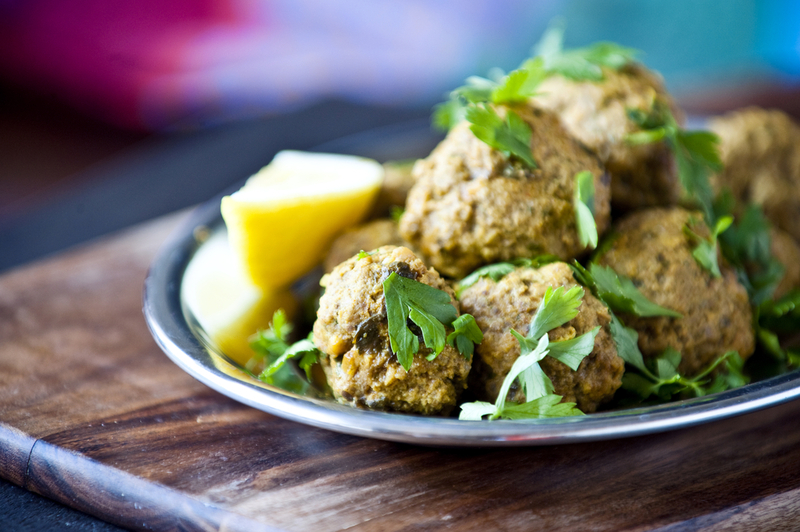 Serve with salad, pita bread, natural yogurt and lemon wedges. Recently my family came for a trip to the country to celebrate my Dad’s Birthday, eat, drink and be merry. Being a birthday, a birthday cake was a must and given the recent Malteser Cake I made for Ben the stakes where set pretty high. Which I didn’t mind, until I remembered the mass of food allergies that were coming with them – no chocolate, no coffee, no nuts, no ginger and no berries. YIKES! Can you even bake without these?! 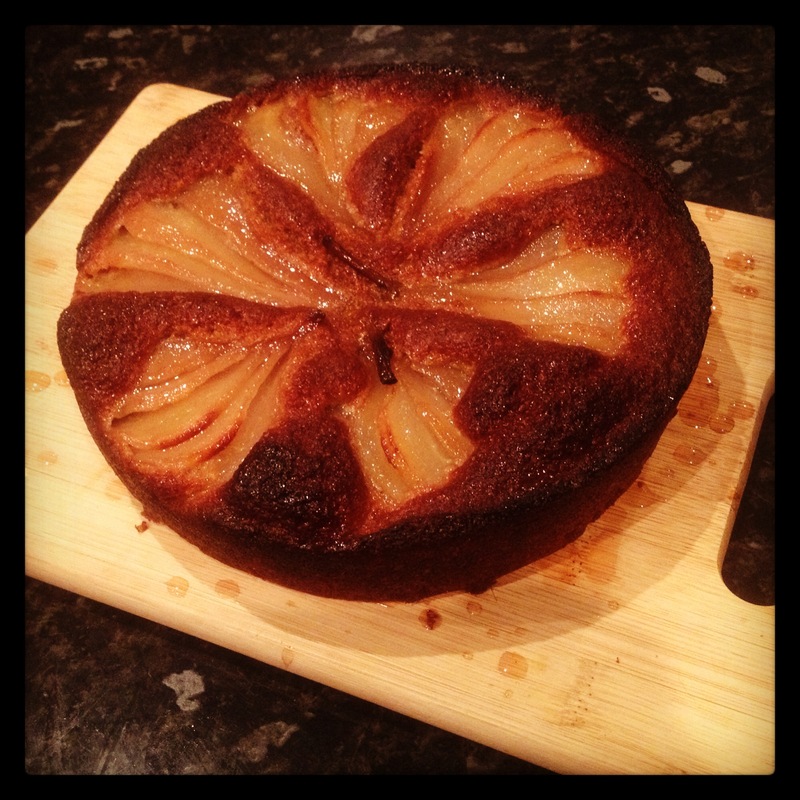 So I put my mind to it and after some major research the Spiced Pear Cake was born, or developed might be more apt. And… it was delicious! Preheat oven to 180C and line a 20cm cake tin with baking paper. Place water, wine, caster sugar, lemon rind + juice, cinnamon stick and vanilla bean paste in a saucepan over a medium heat and stir for 2-3 minutes until the sugar dissolves. Bring to the boil, reduce heat to low, add pears, cover surface with a cartouche and allow to simmer for 10-15 minutes or until pears are tender. Transfer pears to a plate and allow to cool completely then thinly slice to fan. Meanwhile, combine flour, brown sugar, spices and vanilla in a large bowl and mix to combine. Combine butter, milk and egg, pour into dry mixture and combine. 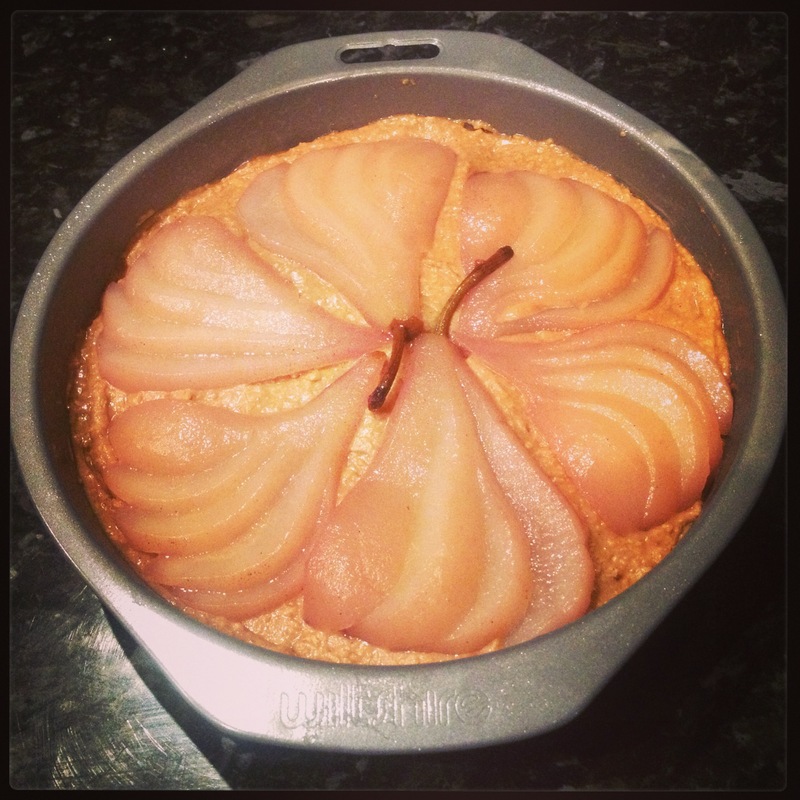 Pour cake batter into the lined cake pan, arrange the pears on the top of the cake in fans. Bake for 45 minutes or until a skewer comes out clean. Set aside to cool for 5 minutes, then transfer to a serving plate. Brush with several coats of maple syrup allowing each coat to absorb into the cake. Serve with reduced pear poaching liquid and good quality vanilla ice cream. NOTE: a cartouche is a circle of grease-proof or baking paper used to cover a dish while poaching or simmering.